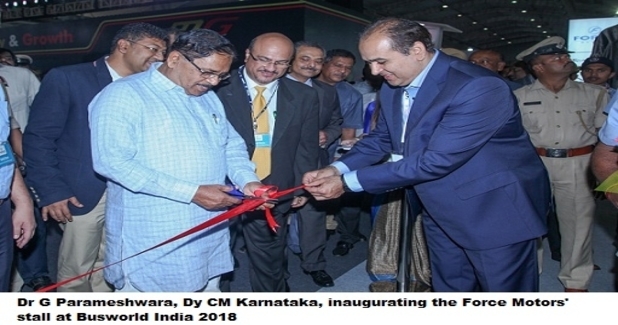 Pune based automotive major Force Motors has launched the country’s only 33/41 seater monocoque buses at the Busworld 2018 exhibition in Bangalore. The Traveller-Monobus is loaded with several path-breaking and novel features offered for the first time in midi-bus (33 – 41 seats) segment. The Traveller-Monobus will be available in 33 seater and 41 seater options in standard and school bus variants at Force dealerships across the country during the upcoming festive season. Traveller-Monobus is powered by the 115 HP / 350 Nm, Mercedes derived, 3.2 liter, common ail engine. On account of the monocoque construction, it is not only extremely robust but also lightweight. It offers peak torque of 350Nm from 1600 to 2200 rpm, the high low-end torque ensures smooth ride even at low speeds. In addition, Traveller-Monobus has best-in-class power to weight ratio and being almost 800 kg lighter than comparable models, offers unmatched fuel efficiency. Traveller-Monobus is the only 33/41 seater with monocoque construction offering outstanding structural strength and unmatched durability. Traveller-Monobus is also the only vehicle in its class to adopt the sixth generation cathodic electro deposition (CED) dip painting process for the whole body, for primer application thus offering the highest levels of rust protection and corrosion resistance. The Traveller-Monobus is the only vehicle in its category with disk brakes on all wheels with new uni-booster hydraulic braking technology, ABS, EBD and latest engine drag torque control ensuring top class, sure stop braking. The Traveller-Monobus is fully tooled up and designed by the R&D team in Force Motors, it is entirely made of pressed steel panels welded in an automated and robotic environment.